The Summer holidays have arrived and MBNA Thames Clippers has a summer of adventure in store for your little monsters. London’s River Bus service has teamed up with Sony Pictures Animation to create a fun-filled treasure trail and quiz through the Capital with Hotel Transylvania 3: A Monster Vacation. Stuck for ideas for a summer day out? The Monster River Trail will keep the whole family entertained with its eight stop route at iconic London spots where monster fans can collect clues at each stop along the way. To be in with a chance of winning a family holiday to Tenerife, or one of 20 merchandise goody bags, simply answer three out of the eight questions correctly. Aspiring monsters who want to be involved in the fun can collect a Monster River Trail leaflet at an MBNA Thames Clippers’ pier to follow the map. In addition, all adventurous humans who complete the trail will automatically get a reward. Simply hand your completed trail form back at one of the manned piers to get yours. In this new instalment of the hit Hotel Transylvania franchise, our favourite monster family embarks on a vacation on a luxury monster cruise ship so Drac can take a summer vacation from providing everyone else's vacation at the hotel. It’s smooth sailing for Drac’s Pack as the monsters indulge in all of the shipboard fun the cruise has to offer, from monster volleyball to exotic excursions, and catching up on their moon tans. But the dream vacation takes a dangerous turn when Mavis realizes Drac has fallen for the human captain of the ship, Ericka, who holds a mysterious secret that threatens them all. The MBNA Thames Clippers Monster River Trail is live until the end of the summer holidays (9 September 2018). 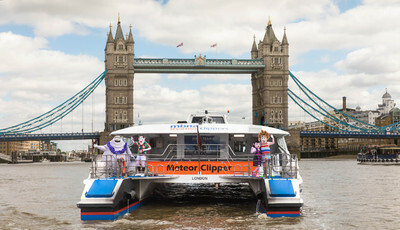 For more information and full competition Terms & Conditions, please visit thamesclippers.com/monstervacation.